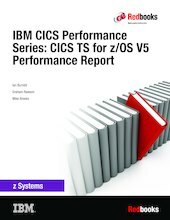 This IBM Redbooks® publication gives a broad understanding of several important concepts that are used when describing IBM CICS Transaction Server (TS) for IBM z/OS (CICS TS) performance. This publication also describes many of the significant performance improvements that can be realized by upgrading your environment to the most recent release of CICS TS. Systems Architects wanting to understand the performance characteristics and capabilities of a specific CICS TS release. Capacity Planners and Performance Analysts wanting to understand how an upgrade to the latest release of CICS TS affects their environment. Application Developers wanting to design and code highly optimized applications for deployment into a CICS TS environment. A description of the factors that are involved in the interaction between IBM z® Systems hardware and a z/OS software environment. A definition of key terminology that is used when describing the results of CICS TS performance benchmarks. A presentation of how to collect the required data (and the methodology used) when applying Large Scale Performance Reference (LSPR) capacity information to a CICS workload in your environment. An outline of the techniques that are applied by the CICS TS performance team to achieve consistent and accurate performance benchmark results. High-level descriptions of several key workloads that are used to determine the performance characteristics of a CICS TS release. An introduction to the open transaction environment and task control block (TCB) management logic in CICS TS, including a reference that describes how several configuration attributes combine to affect the behavior of the CICS TS dispatcher. Detailed information that relates to changes in performance characteristics between successive CICS TS releases, covering comparisons that relate to CICS TS V4.2, V5.1, V5.2, V5.3, and V5.4. The results of several small performance studies to determine the cost of using a specific CICS functional area.